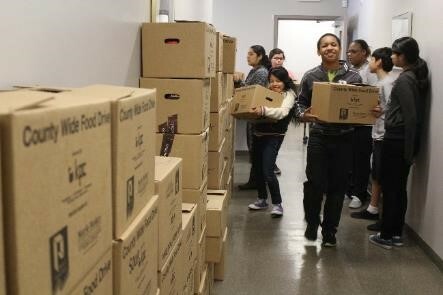 Volunteers at the County Wide Food Campaign help organize food donations for families in need. Grand Rapids has long been a hub for growth and social change, and this fall is no different. Artist Loren Naji and local nonprofit Access of West Michigan are both working to address poverty this October by inviting individuals to experience poverty for themselves. Naji, who currently resides in Cleveland, Ohio, has succeeded in creating a show-stopping piece for this year’s Eighth Annual ArtPrize competition. 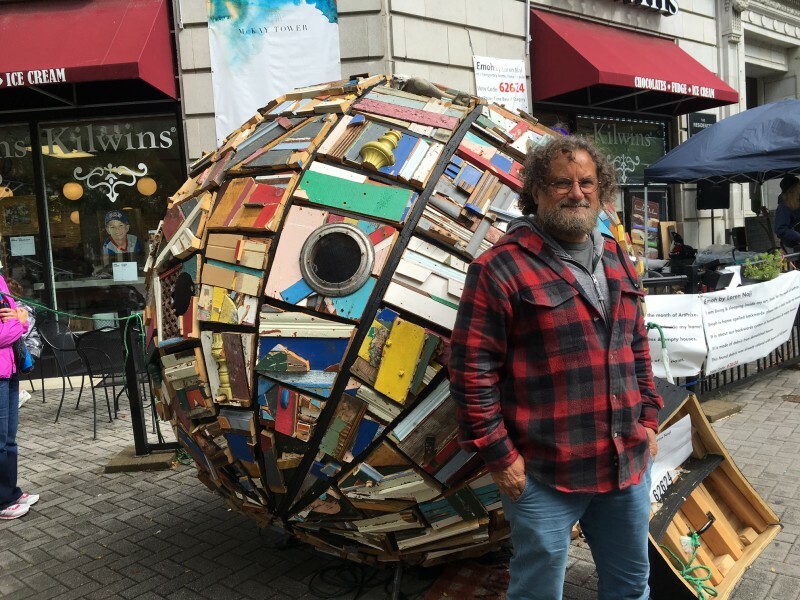 Not only does his giant, spherical entry catch the eyes of the crowd, it has also ignited a flurry of conversation about poverty in Grand Rapids as he creates a temporary dwelling within his art to bring attention to homelessness. Meanwhile, Access of West Michigan is hosting another round of Poverty Simulation Workshops this fall—events where individuals can experience the challenges of living a month in poverty in a matter of hours. Attendees face difficult decisions that mirror those experienced by local low-income families. They also get the chance to hear stories from volunteer staff who have personal testimonies to what a life of poverty is like. Both Access and Naji have the same goal in mind: to cause the West Michigan community to take a second look at poverty and homelessness, then spur individuals to act. Naji’s sculpture, a mish-mash of wood, plastic, peeling paint, and repurposed garbage, has garnered attention from news and the public alike. At eight-feet diameter, brightly colored, and 1,000 pounds, the 3D makeshift home is hard to miss in its current location near Rosa Parks Circle in downtown Grand Rapids. “While building cities, houses, and furniture we use resources, destroying Earth, our home. Cities, full of homeless people, are riddled with vacant homes headed for landfills,” reads the art’s description. The giant multi-material, hollow globe is constructed from the ruins of abandoned homes in Cleveland, Detroit, and Grand Rapids. Naji affectionately calls his creation “Emoh,” or the word ‘home’ spelled backwards, hoping to make a statement about what he calls society’s “backwards” attitude towards homelessness. Emma Garcia, Co-Executive Director for Access of West Michigan, stresses the organization’s renewed focus on finding permanent solutions and education of the community as opposed to only focusing on food donation, the thing that many food pantries are known for. “We have shifted to long-term investment in the local economy, not just seasonal food drives. Our annual County Wide Food Campaign has also shifted to involve awareness and educational opportunities,” Garcia said. The Poverty Simulation Workshops that Access hosts every few weeks are another way that the community can be impacted beyond a one-time food donation. Naji also recognizes that fighting homeless does not start with institutions, but with individuals. “I love the idea of ArtPrize,” he said, “that the public is involved in the art.” The artist has committed himself to actually living within his creation for the entirety of ArtPrize, which runs from September 21 through October 9. The public has already responded well to Naji’s art and “Emoh” has garnered a spot in the ArtPrize Eight Public Vote Final 20 entries. Naji spent one night this month at Mel Trotter Ministries, where he met individuals who face the reality of homelessness. “I’ve learned that there are a lot of different reasons for homelessness,” said Naji. “A lot of [these people] shouldn’t be homeless. A lot of them once had money. They all have different stories.” Bringing attention to those stories and causing a demand for change is what drives Naji and Access of West Michigan. And how does Naji’s time in “Emoh” compare to real-life homelessness? “I’m sure they have it much worse than I do. You know, I’ve got a little ball to live in with a tarp over it. They have to wrap up in a box on the sidewalk,” Naji said. It is these real-life difficulties that both Naji and Access are working so hard to change in West Michigan.